Following on from our tribute to the Specialist Games range fellow #warmonger, Michael (@M_A_Hobbs) has written about his great fondness for the long-lost Man O War. In the Specialist Games tribute Phil (our noble leader) mentions a Golden Age in Games Workshop’s timeline; which he says was between 1998 and 2002 and it’s true that during that time Games Workshop produced some fine games and maybe the company had different ideals to what they have now. However for me the Golden Age of Games Workshop was a bit earlier; the early 90’s. During that period we saw all sorts of games being released by the company. Board games like the original Horus Heresy and Battle for Armageddon, classic games like Epic: Space Marine, the old favourites like 40K and Warhammer Fantasy were getting new editions and Mighty Empires was allowing Warhammer players to fight larger campaigns. But there was another game that like a firework on November the 5th, arrived with a bang, shone brightly and then vanished after what seemed like no time at all. That game was Man O’War. 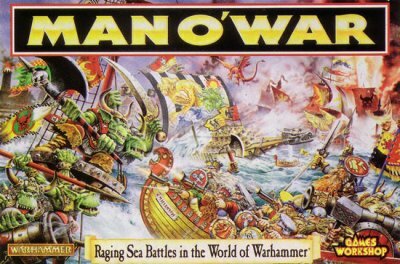 Man O’War was a naval game set in the Warhammer Fantasy universe and was released in 1993. Players would command fleets of ships and fight battles against their enemies, it was the perfect excuse to talk like a pirate and have some fun; I loved it. Unlike other games the entry cost for Man O’War was fairly low; a normal sized fleet would only be about a dozen ships and this meant you could get a fleet together quickly and relatively cheaply, in hindsight this may have been its downfall. The big boxset came with an absolute pile of card counters and markers, each ship had a template that allowed you to track damage, and there were damage counters, sunken ship counters, islands and measuring sticks as well as a dozen plastic ships and sails that you could attach to them. This release was backed up with a load of metal ships that covered all the ships that were in the main rules. The main races were covered in this first wave and each race had its own style and their own pros and cons. The Elves had large fast galleys that were brittle in combat. The Dwarves were slower but had steam power so they weren’t dependent on the wind. The Orcs had ramshackle wrecks that caused havoc whenever they got into range. And so on. Game play was simple and introduced the idea of ships taking damage gradually over many turns before they sank, in many ways it was similar to the way Titans took damage in Epic. In each turn players would firstly roll for initiative (this might also change wind direction) then there would be a magic phase if any fleets had a wizard on board, then would follow the action phase where players would alternatively activate a unit (maybe a squadron of smaller ships or one large ship) and they would move and then open fire if in range, or maybe try to board another ship and do some hand to hand combat. Then the other player activated a unit and so it went on until the end of a turn. The shooting mechanic was simple, you would roll a number of dice if your guns were in range, declare if you were firing High or Low, then you would roll on the ships damage template and see which part of the ship you had hit, the enemy player would then roll a saving throw to see if the hit caused any damage, and each area that was damaged would cause an effect on the ship. This would continue until the ship was no longer able to fight or it had taken hits below the waterline that would sink it. There were rules for ramming, critical hits and fire and you could even board ships and try to capture them for victory points at the end of the game. Later on in 1993 a supplement was released called ‘Plague Fleet’ which introduced the Chaos fleets to the game and in the following year the final supplement ‘Sea of Blood’ saw the light of day. Sea of Blood saw flying units join the various fleets as well as sea monsters that could appear during a game. New metal miniatures accompanied both releases and generally the standard of the minis was good, however it became clear that Man O’War was not generating the return that was expected and in 1995 it was removed from shelves and never sold again by Games Workshop. In all the game lasted for 2 years, but fans being fans the legacy of the game went on, you can still pick up versions of the game on various sites but prices for some of the rarer miniatures are high as you would expect. Last year I decided to dig out my old fleets and I took the game down my club and played it with a few mates. And it was a great night, sometimes we look back at old games with rose-tinted glasses on but honestly Man O’War was as much fun to play in 2012 as it was in 1993 and for that reason I always list it in my top 3 games of all time. I think it’s fair to say that during the early 90’s Games Workshop were trying lots of new things and were trying to work out what kind of company they wanted to be. It was clear that board games and games like Man O’War didn’t really fit in with the long-term plan for the company, and over the rest of that decade we saw less new games being released and more releases of current games. They seemed to settle on some core games which would take them forward into the new millennium and some classics were lost. It wasn’t all bad though as in 1999 we saw the release of another game, that I always thought of as the spiritual heir to Man O’War; Battlefleet Gothic. It plays out like an early medieval naval game, ships can only shoot in very specific arcs of fire, you can ram other ships, you can carry out boarding actions, all of which you could do in Man O’War. Twenty years since it came into being it’s still being played and I think that speaks volumes of its quality and pedigree.